Who is the mysterious Italian novelist who goes by the name Elena Ferrante, is one of Time’s 100 most influential people on the planet, and is the author of the beyond-bestselling, zeitgeist-forming Neapolitan Novels? 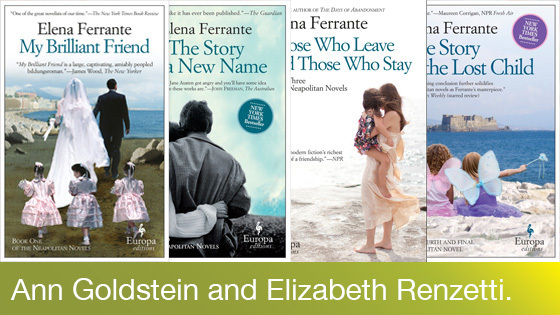 We are delighted to welcome translator of Ferrante’s novels and New Yorker editor Ann Goldstein to tackle the enigma head-on at our cinema, in conversation with novelist and Globe and Mail columnist Elizabeth Renzetti. On the occasion of the Canadian launch of Frantumaglia: A Writer’s Journey, a collection of Ferrante’s non-fiction writing, Renzetti and Goldstein will discuss what makes the Italian author’s work so lucid and impossible to put down, as well as what it’s like to work with an anonymous author, and much more. You’ll never get closer to meeting Ferrante than through these two outstanding women. Presented with Europa Editions and Flying Books. Co-presented with the Istituto Italiano di Cultura in Toronto.